To elaborate on Papal Teaching is our mission on Plinthos (Gk. "brick"); and to do so anonymously, so that, like any brick in the wall, we might do our little part in the strength of the structure of humanity almost unnoticed. 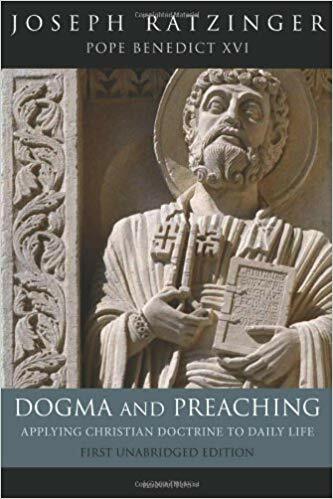 In his 1973 book Dogma and Preaching, English edition, San Francisco: Ignatius, 2011, Cardinal Ratzinger explains various principles for the dogmatic content of preaching. He provides two outlines: four essential sources for the dogmatic content of preaching, and seven theses of dogmatic content for preaching. Four Standards for Preaching the Gospel Today, 26-39. 1. Sacred Scripture: the interrelated unity of Old and New Testament. 2. The Creeds, then the dogmatic statements that supplement the Creeds, ranked according to the hierarchy of truths, cf. Introduction to Christianity, 1970, 50-64. 3. The living Magisterium of the living Church. 4. The concrete faith of the Church in her communities with its promise of indefectibilitas, abiding in the truth. Seven Theses for Preaching God Today, 88-103. 1. God should be preached as Father, Son, and Holy Spirit, 88-91. 2. God should be proclaimed as Creator and Lord, 91-93. 3. God should be preached as Logos, 93-95. 4. God should be proclaimed as Jesus Christ, 95-97. 5. God should be preached as he is reflected in the Law and the Gospel, 97-99. 6. The proclamation of God finds guidance in biblical discourse about God, especially in the parables of Jesus, in the experiences of the saints, and in the faith-reflection upon these experiences, 99-100. 7. The proclamation of God must lead to prayer and come from prayer, 101-103. Bishops Must Reject "Conspiracy of Silence!" UPDATED: Shoddy Legal Analysis, Or ...?